Heavy smoke rose from the building which was surrounded by security forces as people were rushed to the hospital. The health ministry said at least eleven people were wounded. 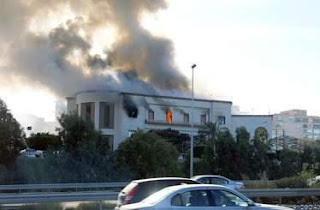 The ministry denounced the attack on its employees, saying: "the Libyan people are waging a war on terrorism on behalf of the world."